drive to Interlaken along the lake of Thun. drive to Interlaken over the Brünig pass. 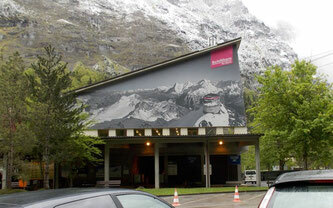 2) Exit the Autobahn at the "Wilderswil, Grindelwald, Lauterbrunnen" exit. Follow the signposts to Wilderswil, Grindelwald, Lauterbrunnen – drive through the village of Wilderswil and continue straight on up the valley to Lauterbrunnen. Walk up the little path to the left across field to get to the mountain hostel.